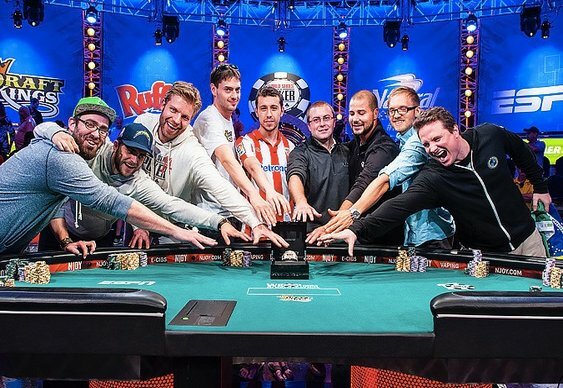 The final table of this year's WSOP Main Event has finally arrived. After more than one week of grinding, the $10,000 tournament has managed to whittle down more than 6,000 players to just nine hopefuls. Throughout the final day it was a case of shattered dreams for a number of high ranking pros, including the likes of Dan Smith, Bryan Devonshire and the UK's Craig McCorkell. Indeed, with Iaron Lightbourne hitting the rail in 22nd place for $286,900 it looked as though McCorkell would follow in the steps of such luminaries as James Akenhead and become the lone Brit at the final table. However, as the field continued to thin the pressure mounted on the young pro and as his stack dwindled he finally made a move with Kc 5c. Unfortunately, Mark Newhouse was able to make the call with As 9d and as the board ran out 4d Td 7d Th 4h, McCorkell was sent to the rail in 13th place to collect his $441,940 consolation prize. With the field now down to 12 and Newhouse on the brink of making back-to-back final tables the atmosphere inside the Rio gradually turned tense. In the end something had to give and with the final ten players all now sat on a single table it was Luis Velador who eventually succumbed to the pressure. After sitting as the short stack for hours the Mexican finally moved all-in with pocket fours but found himself dominated by Newhouse's fives. An unhelpful board eventually brought an end to Velador's WSOP dreams and, as he strolled off to collect his $565,193 consolation prize, this year's final nine bagged and tagged their chips ahead of their return on November 10th.